STEPANAKERT—Armenia’s Prime Minister Nikol Pashinyan on Saturday, accompanied by Artsakh President Bako Sahakian visited the eastern border of Artsakh and Azerbaijan, known as the line of contact. Pashinyan was there to become acquainted with the situation on the frontlines, to meet the soldiers and address issues of their service. Earlier on Saturday, Pashinyan and Sahakyan visited the Artsakh Defense Ministry and during a consultation with Artsakh’s military leadership discussed issues related to the ongoing enhancement of the Defense Army’s combat efficiency, military cooperation between Artsakh and Armenia, as well as the situation on the frontlines. Taking part in the consultation were Armenia’s Defense Minister David Tonoyan and the Artsakh Defense Minister Levon Mnatsakanyan, who were joined by Armenia’s Armed Forces chief of staff Artak Davtyan. I hope Pashinyan brought some encouraging news following his “closed door” meeting with Putin. If Russia still plans on being a strategic ally then it must provide tangible assistance to the Armenian side. Otherwise, the Azeri’s recently acquired Israeli rocket system will not only rain down on Armenia proper but on Russian troops stationed there as well. Putin can’t play both sides any longer on the argument of maintaining equal strength between the foes. The rules of the game have changed and it’s high time for Russia to prove itself. 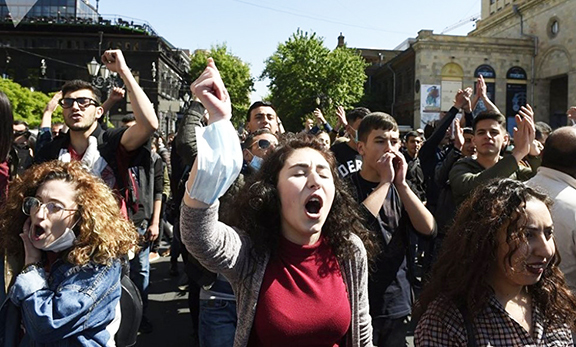 If it continues with its current policy then it will only prove that Armenia is merely a pawn for their bigger ambition; to control Azeri resources at the expense of Armenian blood.